NBC4 aired the 6th segment in its ongoing investigation of SSFL, “Living in the Shadow of a Toxic Mess,” on February 29, 2016. The investigation examined whether contamination from SSFL has migrated into Runkle Canyon, where a new housing development is nearing completion. Two stories that aired in November, “Camp Cover-Up,” and a follow-up segment, also looked into contamination questions at the nearby Brandeis-Bardin Institute children’s camp. 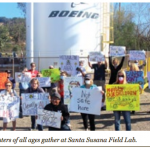 The SSFL Work Group will take a close look at contamination issues at Runkle Ranch and the Brandeis-Bardin Institute at its upcoming meeting, Wednesday March 16 at 6:30 pm at the Simi Valley Cultural Arts Center, 3050 Los Angeles Avenue, Simi Valley, CA 93065. The meeting will also provide an update on efforts by the parties responsible for the pollution to walk away from their cleanup obligations and leave the most of the contamination not cleaned up. The Work Group will examine troubles at the state toxics agency, which has come under fire for failing to protect many communities in California (such as those near the Exide plant in Vernon) and efforts to reform the beleaguered agency. The SSFL Work Group will also remember the life and service of Gregg Dempsey, a senior scientist and radiation specialist at the US EPA who died in December. 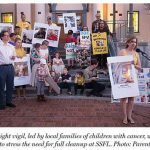 Gregg’s exemplary service to the SSFL community going back to 1989 was instrumental in key revelations about the problems at SSFL and to the EPA survey released in 2012 that found 500 locations at SSFL that were contaminated with radioactivity. Why does affluent Porter Ranch get more urgent environmental relief than working-class Boyle Heights?